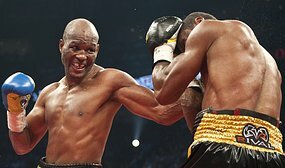 Last night, Bernard Hopkins beat Jean Pascal last night to win the light heavyweight championship at 46 years old. Not only is this an unequaled performance for a man of his age, it was perhaps the most exciting boxing match he has ever fought. Where were you on October 11th 1998? This is the date of Bernard Hopkins first professional fight. He had recently been released from a 5-year prison stint for armed robbery and swore that he would never return to that place. He lost the fight. Last night, 23 years later and older, he beat the light heavyweight champion of the world to become the light heavyweight champion of the world. Jack Nicklaus at 46 Winning the Masters: I am a huge golf fan. But, really? Tom Watson just almost won the British Open nearing 60. Now, if Jack Nicklaus would have been getting beaten on by a 28 year old brute intent on destroying him during the final round of the Masters and still won, we could talk. Al Unser jr. age 47 Indy 500: My dad still drives a car at 73. He’s not winning any awards. Martina Navratilova age 49 U.S Open: This is second best in my opinion, but still, it was mixed doubles. Willie Shoemaker age 54 Kentucky Derby: 2 minutes riding a horse? C’mon. Quite easily, last night’s performance of Bernhard Hopkins surpasses these accomplishments by others. And, of course, this performance also bests the previous boxing title won by Geoge Foreman at 45, which is also a feat greater than any of those from other sports. While the name Bernard Hopkins will be remembered for this great triumph, I will remember this as the best fight of Bernard Hopkins career. Boxing has suffered in the last 10 years due to rise of MMA and to the lack of boxing champions who are willing to fight. The one man who has kept boxing afloat these last 5 years is Manny Pacquiao, who is in a class of his own. Boxing’s other pound-for-pound king? Floyd Mayweather. Floyd Mayweather not only gives boxing a bad name, he might also do the same for humanity. Though he is highly skilled boxer, he won’t fight the fight everyone wants (Manny Pacquiao) and he is un-willing to lay it all on the line in the ring. Boxing is often referred to as “the fight game”. Well, it’s not a fight if one person runs around not getting hit and then gets a few pot-shots in to win the round. This is how Bernard Hopkins’ fights used to be. Avoid getting hit at all costs and only hit your opponent if it does not violate rule #1. Translation: boring! Last night in Montreal, Bernard not only set-aside father time, he gave boxing fans what they want: a fight! By me and the millions watching around the world, last night will be regarded as one of Bernard Hopkins’ best fights ever. When will Tiger Woods Play Golf Again? Has Roger Federer Won a French Open?